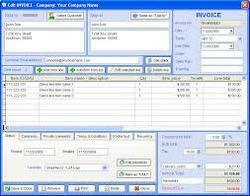 Waltz Billing(WB) is an easy to use software product that provides all the features used for billing purchase, billing on printing stationary or blank stationary, date-wise billing information, party-wise billing information and tax related information is integrated in Billing Manager. GST enabled billing software for all kind of general trading. GST Software is a complete inventory and accounts management software system that gives you the ability to control your financial situation, inventory as well as your relationships with your customers, suppliers and employees.. Manage contracts, create beautiful invoices, bill time sheets, get paid faster. Actions and specific information based on journal type. Infi is our latest inventory management software that controls your inventory and stock levels with easy-to-use tools designed to take the hassle out of inventory management. Manage Multiple-warehouses, stock transfers, refunds and Keep your stock levels up-to-date. Verification Of Bill Of Materials. Restaurant POS Software with KOT and Multiple Section Handling Software are built for hospitality, table dining business, fast casual checkouts, hotels and motels, bars, nightclubs, corporate style cafeterias and catering services.